Welcome to Rumburgh Farm free range turkeys. Our picturesque family-run farm is situated in North Suffolk in a beautiful part of East Anglia. We have been producing free-range turkeys for the Christmas market for over 25 years and are very proud of our quality birds. We only rear slow growing strains that are grown to full maturity, 24 weeks+. This maturity is very important as it produces a superior product which has a mouth watering flavour and most succulent texture when cooked. The turkeys are fed a quality cereal based diet and have the freedom to roam every day on grass and in open woodland. They are housed at night in straw bedded barns. When the birds reach maturity, in December, they are slaughtered and hand plucked on the farm by ourselves and a small local team of staff. This involves the minimum stress to the birds. The turkeys are then game hung in our temperature controlled chillers for a minimum of 7 days prior to evisceration to enhance all the natural gamey flavours. Our turkeys are beautifully presented in an attractive carry out box that includes a fresh sprig of rosemary, cooking instructions and a pop-rite cooking timer so you can cook your turkey to perfection – without any stress. As we are members of the Traditional Farmfresh Turkey Association (TFTA) our farm is independently inspected each year to verify that our turkeys are raised to the highest welfare standards. 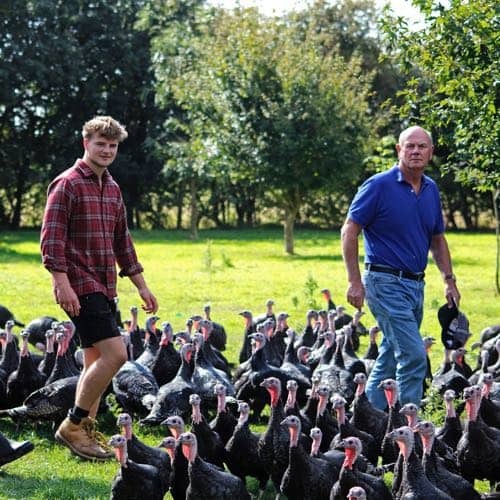 Treat your family to a Rumburgh Farm free-range Bronze or Norfolk Black turkey this Christmas.